Ever need a cold one while shoveling snow off the driveway? 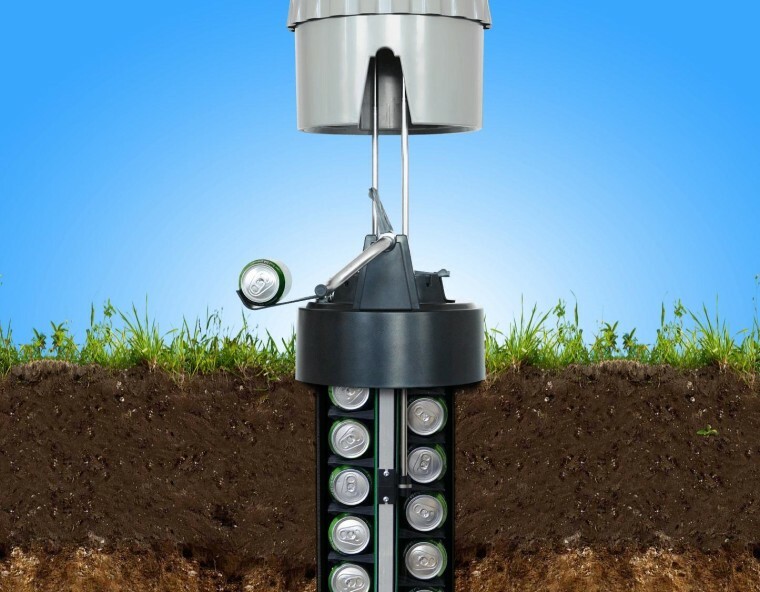 Bury the eCool can dispenser in your yard and you won't even have to go inside to slake your thirst. A handle conveys a drink up from deep in the earth — and assuming you live somewhere significantly less than tropical, it should be refreshingly cool. As you might expect from a Danish invention, it's not exactly geared toward use in warmer climates. The idea is that if the temperature outside your back door and a few feet down is consistently below 50 degrees or so, you can keep things cool there without spending a dime on electricity. Keep in mind that in the winter, ground temperatures can be several degrees warmer than the air up top, so it might be better to just put the six-pack outside for a few minutes. Yes, it's a bit ridiculous, and at 1895 kroner (about $350) it's not exactly cheap either. But can you really put a price on pulling the beers out of the ground at the first barbecue of the season? The target demographic for this contraption is definitely limited, but not that much more so than a robotic lawn mower — or for that matter, Google Glass. If you live somewhere cold but also like your drinks cold, you might find a use for this thing.